The first two chapters demonstrate that the acquaintance the 19-year-old Rilke claims to have had with Nietzsche's essay On the Use and Disadvantage of History for Life provides a key to understanding Rilke's lifelong preoccupation with relics of the past and his antipathy toward the present. The third and fourth chapters involve a close reading of various Rilke poems reflecting elements of Nietzsche's Thus Spake Zarathustra. 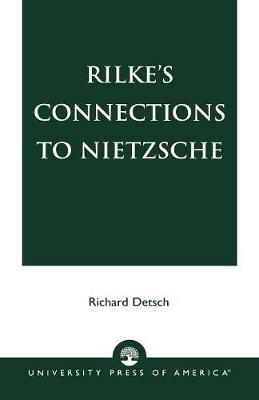 The fifth chapter deals with certain recurring Rilkean motifs in their relationship, specifically, to Nietzsche's eternal return. The sixth chapter treats Nietzsche's The Birth of Tragedy and Rilke's commentary on this work.